All Mouse Media publishes a range of comics, online and soon also in print. We don’t stick to one genre or one format, we produce everything from situational comedy to gritty sci-fi and drama. Here are our main titles. Debuting in January 2009, All over the house chronicles the misadventures of Emily Westwood and Tesrin Stepford-Brown. One is a cynical and world-weary journalist turned MP, the other is a barrister who knows how to conjure up monsters. Together they have wacky adventures, whether they want to or not. 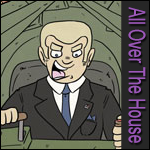 All over the house updates five days a week, bringing you jokes and drama in the tradition of newspaper comics. Join Emily and Tesrin as they wreak havoc in the highest offices of the land, find weird and wonderful things to do on the Internet or simply battle to stay one step ahead of the latest batch of monsters popping up all over the house! Because sometimes people with drive find their foot is pressed firmly down on the accelerator, Ink Proof Cannon was born. It’s a webcomic. It’s an anthology comic. It’s a proving ground for new talent and new stories. 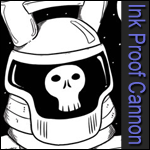 Running five comics at once, each updating one day a week from Monday to Friday, Ink Proof Cannon showcases the best in science-fiction and fantasy. It runs the entire spectrum of emotion; from humour to horror and all the way out the other side. 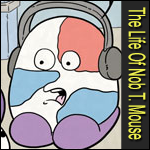 Debuting in 1996, The Life of Nob T. Mouse is Britain’s first ever web comic and one of the oldest webcomics still in production. It tells the story of Nob Mouse, a part-time adventurer who would like nothing more than to settle down to a quiet life running his own café. Unfortunately the universe has other ideas. You see, Nob Mouse lives on a mass of quantum instability that acts as a plug of sorts, blocking the hole in the universe caused by the Big Bang. This means a lot of monsters tend to wander the small frontier town of Blob City, where Nob Mouse lives. If he wants a quiet life, it looks like he’s going to have to fight for it. New episodes are published five days a week.